Piers Eaton in Sport on 3 March, 2017. 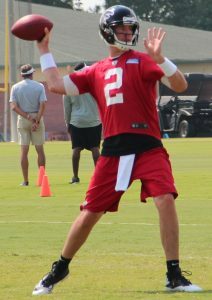 Matt Ryan may be one of the best at his sport, but what that sport is called differs throughout the world. It usually starts with me saying something about football, then someone saying “it is not football, you use your feet in football”. Then I say “well how are they meant to run without using their feet”. Which is followed by “well their feet hardly touch the ball, and the ball isn’t even round, it should be called hand-egg”. At this point I realise that I hate having this debate, and I either move on or just get really annoyed. I used to make the argument that the game is called football because the ball is a foot long, or that you kick the ball to score as well, but I was wrong. This leads me to the overall point here, that most likely what you think of the term football explicitly refers to, you are probably wrong. It is common belief the etymology of the word football comes from the action of a foot kicking a ball, and while there is no certainty, it is significantly more likely this is wrong. Etymologists often believe the term football instead originally referred to sports in medieval times played on foot, instead of on horseback. There is no concrete proof of this, but it makes more sense. Football, even to people in the UK, refers to more than just the football played in the premier league. Rugby, whether you watch union or league, are both variations of the sport rugby football, and they both emanated from the traditional English game of football. Gaelic football is another example of a football that is not your ‘just football’ as many describe a certain type of football. In truth, what most call ‘football’ is actually technically called association football, but nobody ever calls it that. The nickname for association football – ‘soccer’ – comes from a shortening of the word association with an -er put on the end as a suffix, and this nickname is English in origin. The only reason it’s more popular in North America is that it solves a lot of confusion, as we have two popular games called football. People often get mad at me for calling it soccer, claiming “that’s not what it’s called”. The professional association football league in the U.S. is the MLS, which stands for major league soccer; so actually, soccer is the term used for the sport, just not in England. Football is essentially an umbrella term that encompasses lots of other terms. Football can mean rugby football, which has further types of rugby such as rugby league and rugby union. Football also can refer to gridiron football, which includes American football and Canadian football (Canada has its own league and rules for the sport that dominates in the United States). So next time you call American gridiron football by the name ‘football’ and someone says your wrong, just show them this piece. They may not be convinced by it but it is better than having the debate over and over again.